Welcome to Digital Digest! This week, we've got reviews of Rocko's Modern Life - The Complete Series and Matlock - The Eighth Season. Let's get started! Laverne and Shirley are "gonna do it" once again on DVD this May! On May 21, CBS will release Laverne & Shirley - The Sixth Season on DVD at a $39.98 MSRP. With this release, the seventh and eighth seasons will still remain to be released, so hopefully we'll see those soon. There is still no word on the remaining seasons of Happy Days or Mork & Mindy (which only has one season to go, yet the most recent release was released over five years ago), but hopefully CBS will get back to those soon. 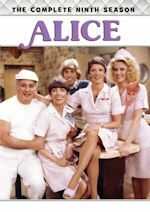 A few weeks ago, TVShowsOnDVD.com mentioned a listing for Alice - The Complete Third Season appearing on amazon.com, with a release date of February 12. That release didn't happen, but it appears that it will be coming, at least eventually. We have confidence that we'll see this from Warner Archive, and we'll let you know when that happens. 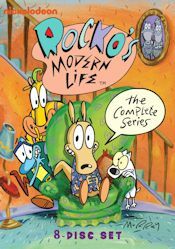 Tuesday (February 26) brings releases of Rocko's Modern Life - The Complete Series and The Client List - The Complete First Season. We have a review of Rocko's Modern Life in this week's Digital Digest, and we'll have The Client List next week. America's favorite animated wallaby is back on DVD once again... this time, with every episode in one set... in Rocko's Modern Life - The Complete Series! The eight disc set from Shout! Factory compiles all 52 episodes from the entire four season run of the series that ran on Nickelodeon from 1993 until 1996. While it was not one of the biggest Nicktoons ever, it did manage to become a worldwide cult favorite, and was loved by fans of all ages. Now, after releasing the first three seasons, Shout! has decided to place all four seasons in one value-priced collection. Since this set contains 52 episodes, most containing two segments each, we'll skip on going into a lot of detail on the episodes of the first three seasons. We've already reviewed all of these seasons, and you can check out our reviews of season 1, season 2, and season 3 for details. Since we haven't reviewed season 4 (it has not been yet released individually), we will go into details on those episodes. Season 4 begins with "With Friends Like These," where Rocko is forced to choose between friends. In "From Here to Maternity," somebody is expecting a bundle of joy. Rocko's former bully stops by in "Wimp on the Barby." Heffer decides to move out in "Mama's Boy." In "Magic Meatball," Ed Bighead begins to make big decisions using a magic 8-Ball. Filbert is suspected of being an alien in "The High Five of Doom." In "Heff in a Handbasket," Heffer sells his soul... just so that he can be on a game show. Rocko gets arrested after ding-dong-ditch gone wrong in "Dumbells." Heffer's mother asks Rocko to teach her how to drive in "Driving Mrs. Wolfe." The series ends with "Floundering Fathers," where the group looks back at the founding fathers of O-Town. The packaging for this set is along the lines of the previous season releases, except (of course) in a much thicker package. Essentially, the set packages all of the discs in a DVD case that is twice as thick as a normal case, with four two-sided trays inside. The cover has a photo of Rocko, Filburt, Heffer, and Spunky (new artwork done by creator Joe Murray), with the same photo on the back, along with a series description. Inside, you'll find the eight discs, all of which have the same artwork that was used on the season sets. Unfortunately, this release does not include any episode listings at all. The menus for this set are identical to all of the previous releases. On the main menu, there is a listing of all of the episodes (you can start with either segment of each episode), along with a Play All option. Any special features are also listed on this main menu as well. The closing theme music plays in the background on the menus. Chapters are placed within each episode. The video and audio quality on the set is nothing particularly impressive, but it looks fine for an animated series created 20 years ago. You'll find a few defects here and there, but it is nothing that takes away from the enjoyment of the episodes. The audio is decent as well, and is very loud and clear. All of the episodes contain closed-captioning. The set includes all of the special features included on the previous releases, along with one new one. On Season 4/Disc 2, you'll find "Wacky Delly Live 2012" (51:51), which is a 2012 table read of that particular episode in front of a live audience... but really it is much more than that, as there is an interesting Q&A with the cast at the end. This really remind me a lot of those excellent Comic-Con special features found on some of the Family Guy DVD sets. The other special features are the same as what was included on the individual season sets. 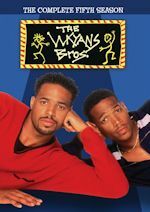 Season 1, of course, had no special features. Season 2 has "Behind the Characters" shorts (16:11) and the original pilot version of "Trash-O-Madness" (8:09). Finally, Season 3 has "Selected Scenes Commentary by Joe Murray" (30:23). This is a decent set, but I'm just wondering why Shout! chose to release the series in this manner. It would have been better if they'd just started by releasing this complete series set at the beginning, or released season four before this set. But this method... one that consumers tend to not really like... means that a lot of fans who have bought the first three seasons either have to buy all of them again to get the fourth season, or wait until the separate release comes along. If you haven't bought any of the previous releases, then this set is certainly a good deal and worth picking up. But if you do have those releases, it may be worth just waiting for the season 4 release to come along, as this set doesn't really offer anything new aside from season 4 episodes. In any event, I'm glad to see this series complete on DVD, and encourage everybody who loved the series to own it one way or the other. It really does maintain the charm that it had when it originally aired, and fans young and old are sure to love it. 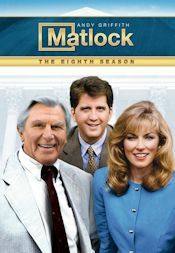 Ben Matlock (Andy Griffith) has returned for the defense (and also to help the prosecutor figure out who REALLY did it) in Matlock - The Eighth Season. 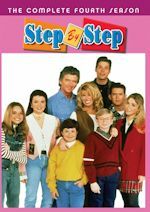 The next-to-last season of the series, and also the second season to air on ABC (after it moved from NBC in 1992) brings back Matlock, his "partner of the season" (and also daughter) Leanne (Brynne Thayer), and his investigator... another role that had frequent cast changes... Cliff (Daniel Roebuck). This six disc set collects 20 more episodes of the series, where Matlock finds himself entangled with killer comedians, lowly kidnappers, crooked D.A. 's, and more. The season begins with "The Play," where Matlock plays a detective in a community play... but when a murder occurs, he may not just play a detective anymore. Matlock ends up entangled in a double murder in North Carolina in "The Fatal Seduction." Matlock visits the wife of his first client from 1962... a black cook accused of killing a white sheriff... in "The Diner." Matlock witnesses an argument from his hotel window that turns into something much bigger in "The View." One comedian is accused of killing another in "The Last Laugh," and it is no laughing matter. In "The Capital Offense," Matlock has reached the end of the road on saving a seemingly innocent man from death row. Matlock's client resembles a dead man in "The Haunted." In "The Conspiracy," Matlock defends an attorney charged with killing a fellow lawyer. Matlock takes a trip back to 1932 (and into a murder case) in "Matlock's Bad, Bad, Bad Dream"
Leanne finds herself falling for a client in "The Defendant." In "The Kidnapping," Billy gets kidnapped, and Matlock has only a little time to save his friend's life. Leanne falls victim to a criminal who steals her journal in "The Temptation." A choir member is accused of murder in "The Crook." In "The Murder Game," a murder mystery becomes a bit too real for everybody. Matlock goes up against a powerful D.A. with a deep and dark secret in "Brennen." A P.I. 's daughter takes photos that implicate the wrong man in the murder of a Hollywood mistress in "The P.I." In "The Godfather," Matlock's goddaughter is getting married... but not before the wedding turns into a murder to be solved. A young attorney who idolizes Matlock is forced to turn to Matlock after a shady private investigator is killed in "The Idol." Given that this is a CBS DVD release, it should come as no surprise that the packaging is exactly the same as all other CBS DVD releases. The discs come packaged in a standard Viva case, and there is a cast photo on the cover. On the back, you'll find another cast photo, along with a brief description of the set. Inside, there are the six discs, each of which have the standard gray CBS DVD artwork. There are also episode titles, descriptions, and airdates printed inside of the case. The menus for this set are similar to the menus used on the seventh season. The main menu has a still photo of Matlock, along with a few episode snapshots, and a list of all of the episodes. There is also a Play All and Subtitles option. Once you select an episode, you get an episode menu. This menu has a photo snapshot from the episode, and gives you the option of playing the episode or the episodic teaser. Chapters are placed throughout each episode. I'm not really convinced that much has been done as far as trying to make the video quality the best that it can be, but despite that, it really looks decent, and about how one would expect it to look. The picture is a bit soft, but I don't think it'll bother people too much. The audio is decent, but nothing spectacular. Each episode contains English subtitles. There isn't much in regards to special features, but each episode does include a 30 second teaser, which CBS bills as a special feature. Really, I feel that this is something that should have been included regardless, but I probably shouldn't complain considering that they did include them, at least. These can be accessed from the episode menus. Once again, CBS has another great set of episodes... but no special features. It is really a shame that they didn't get Andy Griffith to participate in some of the special features on previous releases. That opportunity is now gone, and the most that they could hope to do at this point is to go with archival footage. Still, it is great to see CBS getting close to completing this series on DVD, and after this, there is only one more season to go. I hope (and honestly expect) that we'll see this final season by the end of this year, giving fans once and for all, the opportunity to watch the entire series on home media. Who to Follow: Bill Cosby (Twitter), "Comedy/Education"
Claim to Fame: Does he REALLY need an introduction? Everybody knows exactly who Bill Cosby is. 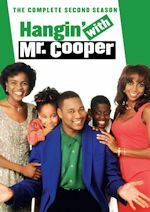 His earliest days included a starring role on the series I Spy, as well as The Electric Company, but he became really big in the '80s as the star of one of the biggest sitcoms ever, The Cosby Show. Even though he isn't starring in any series right now, he still remains active in life and is nonetheless loved by his fans worldwide. Why You Should Follow Him: We love Bill Cosby... who doesn't? He has entertained so many generations of fans that you would be hard-pressed to even find a single person who hasn't enjoyed something that he has done at some point in their life. Although he doesn't keep his Twitter feed going at full speed several times a day (or even every week for that matter), he does drop in from time to time to offer nuggets of wisdom about life and to entertain us with his thoughts about sweaters (why not?). Also, he keeps fans updated on what he is doing in life and even responds (with his own breed of humor) to rumors about his death... which, of course, are not even close to the truth.